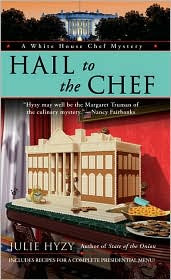 Julie Hyzy's White House Chef mysteries give readers an insider's view of the White House. Who would have ever thought that the executive chef has to be a juggler? Hyzy proves it in her latest terrific book, Hail to the Chef. When the story opens, Ollie Paras, the executive chef, and her staff are preparing for Thanksgiving and Christmas. It's a hectic time with a number of public events scheduled. They don't need bomb scares. And, they don't have time for security training. But, White House safety doesn't hinge on one chef's schedule. However, it might just hinge on Ollie's instincts. Ollie has to cope with the death of the head electrician, who Ollie found, and then another death. The First Lady's nephew had shown an interest in Ollie, and had spent time that day working in the kitchen. It's one more reason she doesn't think he committed suicide. But, she doesn't have time to investigate. She's dealing with pressure to rig a gingerbread man contest, continued security training that interferes with her schedule, and worries about the First Lady. Then, there's her regular job, supervising the kitchen and staff, preparing for meals, special events, and special diets. Don't be deceived by the inclusion of recipes in this mystery. 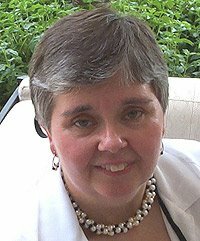 Julie Hyzy's White House Chef mysteries, beginning with State of the Onion, are topnotch, intriguing crime novels, not fluffy lightweights. Ollie Paras is a strong woman, proud of her job and her country. In Hail to the Chef, Ollie does everything she can to keep the White House kitchen running smoothly during a difficult time. But, are there ever easy times for a White House chef? Hopefully, Hyzy will continue to write of Ollie's adventures, providing an intriguing look behind the scenes, as she does, successfully, in Hail to the Chef. Hail to the Chef by Julie Hyzy. Penguin Group, ©2008. ISBN 9780425224991 (paperback), 336p. I LOVED Julie's first book in this series and have the second one sitting on my TBR pile. It has been bumped down a couple of times, but after reading your review, I think it's going to be the next book I read. I had a very nice holiday. I'm going to be sad to see it all end when I go back to work on Monday. I should have taken that week off as well. Oh, well. It saved me a couple vacation days for later. I'm glad you're moving Hail to the Chef up to the top of the TBR pile. My books can get stuck in there! Hope you had a nice holiday! I liked the first also! I knew this one was out, but haven't hunted it down yet! Merry Christmas Lesa and thanks for all the recommendations throughout the year!!! Thank you, Maria! That's really a nice comment, thanks for the recommendations. I'll try to add some more titles that you'll enjoy in 2009.